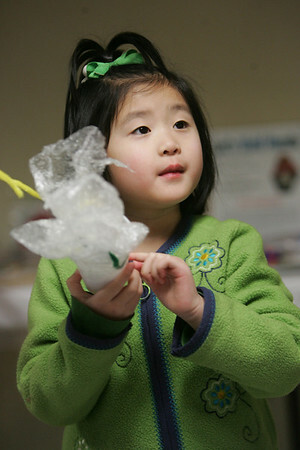 Ruby Scarcella, 5, of Beverly talks about how protected her egg as part of an egg drop at the Beverly Public Library. The experiment was part of the Astronomy Club, an afterschool program at the library for grade school students, where they can learn about Outer Space and the United States Space program. The program was lead by assistant Children's librarian LInda Furey. Photo by Deborah Parker/March 3, 2010.
f, Ruby Scarcella, 5, of Beverly talks about how protected her egg as part of an egg drop at the Beverly Public Library. The experiment was part of the Astronomy Club, an afterschool program at the library for grade school students, where they can learn about Outer Space and the United States Space program. The program was lead by assistant Children's librarian LInda Furey. Photo by Deborah Parker/March 3, 2010.